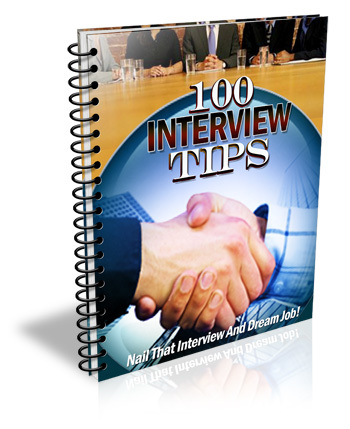 100 Tips = 13 Pages of eliberate interview tips! I PROMISE you there's SOMETHING you're NOT doing. Tell your potential employers that you are looking forward hearing from them - By telling them that you are looking forward getting in contact with them again, you are reiterating that you are indeed very interested in getting the job. If you are among the candidates they are seriously considering for the position, then showing them your interest may eventually seal the deal. Salary expectations - One of the most common questions that may be asked by an employer is your salary expectations. Thus, you should come up with a figure just before the interview. For the amount you want, try to estimate how much they are paying for the position you are applying for. If you are currently employed though, try to make it higher than what you are earning, but don’t overdo it. Nail that interivew and DREAM JOB!